At GBF Enterprises we have been upgrading our equipment to fabricate larger parts. We now have the CNC machines and lifting capacity to produce large parts efficiently. We have made upgrades to our milling capacity, turning capacity, and lifting capacity. Common panels we fabricate are typically 50″, 62″ or 72″ wide and typically up to 144″ long. By using a CNC Router with the bed size to handle the full sheet (6′ x 12′) in one piece our panel routing system produces precision panels in a single operation. 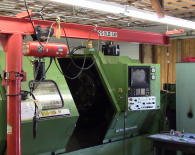 Our largest lathe has an 18 inch chuck, 40 HP, that can make parts up to 43 inches long. We now have overhead cranes in front of all of our big machines.